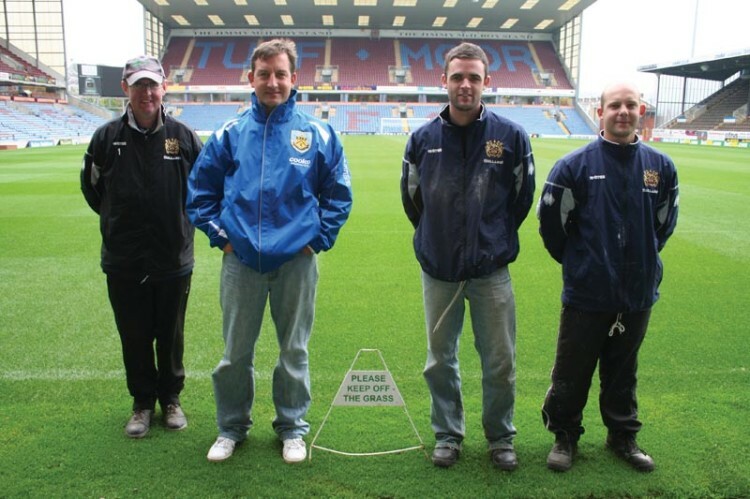 Burnley Football Club's Head Groundsman, Paul Bradshaw, often has to pinch himself. He still finds it hard to believe what he has achieved in his short working career, especially when he sees his beloved Turf Moor pitch on TV. Burnley born and bred he says he could not wish for a better, more satisfying job. 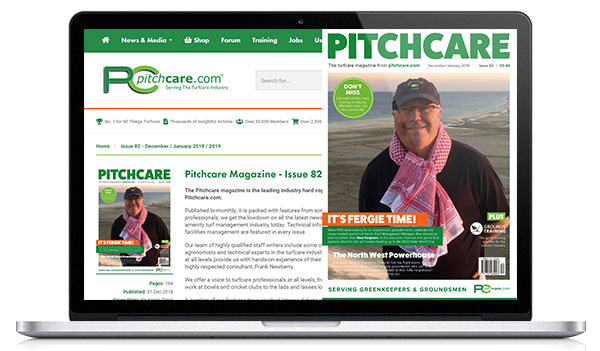 Paul began his sportsturf career as a greenkeeper at Nelson Golf Club in Nelson. After thirteen years at the club, he had had enough of golf and fancied a move into football. He got a job working at Liverpool Football Club's academy, working occasionally at the training ground and Anfield, where he spent four years honing his skills. 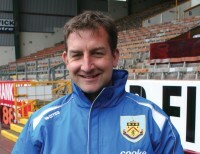 In 2005 he joined Burnley as senior groundsman at the training ground and was promoted to head groundsman, across both facilities, in 2008. 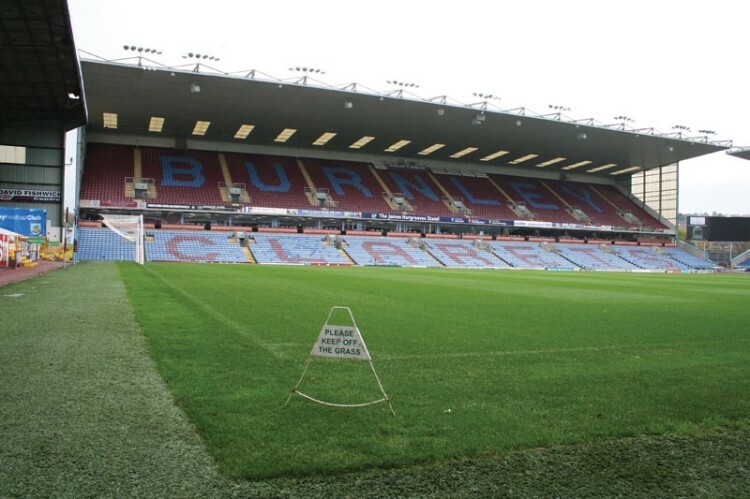 The Clarets, as they are affectionately know, are one of the founding teams of the Football League and their home has always been Turf Moor. They have spent most of their time in the top two tiers of English football apart from a lean spell between 1976 and 1987 that almost saw the club drop into the Conference - only defeat for Lincoln City on the final day of the season keeping Burnley up. Since then they have steadily progressed through the leagues to become one of the 'new boys' in this year's Premiership - four straight home wins, one against Manchester United, announcing their arrival. 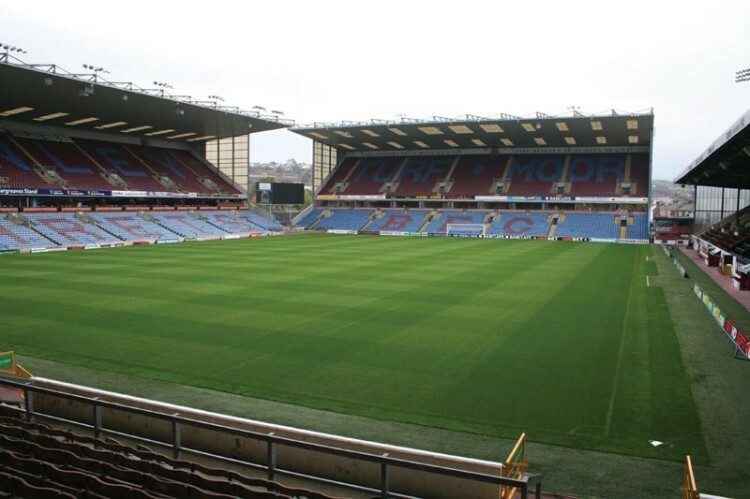 The return to top flight football after thirty-two years has meant that Turf Moor is in need of a face-lift to bring it up to Premiership standard. However, many commentators are of the opinion that the antiquated facilities for visiting teams give Burnley added home advantage. Nevertheless, in 2008, plans were drawn up to extend the stadium to a capacity of around 28,000. This increase would include a second tier attached to the Bob Lord stand, along with a complete redevelopment. In addition, a new stand was planned to replace the Cricket Field Stand - Burnley Cricket Club's ground is adjacent to the stadium - which would also hold a cricket pavilion and hotel. However, with the worsening economic conditions in the UK, these plans are currently on hold. Paul Bradshaw is one of a breed of young head groundsmen currently working in football's top flight. An almost permanent smile shows his obvious delight at being in charge of the pitch at 'his' club and seeing them play against some of the giants of European football. He is assisted by Barry O'Brien, James Blackburn and Aiden McGough. Paul looks after the stadium pitch on a day-to-day basis but is joined by his team on match days. The stadium pitch was reconstructed in 1998, replacing the old soil based pitch with a Mansfield FibreSand one, at the same time adding undersoil heating and a pop-up watering system. Barry, James and Aiden look after the Gawthorpe training ground. Here, there are three senior pitches, one three-quarter pitch (80 x 50 metres) and two small-sided pitches. These are mainly soil-based and, subsequently, difficult to manage through the winter months. But, plans are in place to upgrade the whole facility. 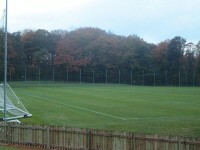 In 2005, the first team training pitch was reconstructed with fibresand to the same specification as the stadium pitch, providing a better surface for the players. A further £2 million investment will upgrade the training ground to Academy Status. This will include the construction of an all-weather floodlit playing facility, along with improvements to the remaining pitches and new changing facilities. Promotion to the Premiership has given Paul much needed funds to replace some of the ageing machinery for both sites. Two new Dennis G860s, with brush and verticutting units, along with a TechNeat SPPS 120 sprayer have been purchased. A Toro pedestrian ProCore 648 aerator, SISIS Megaslit, Ariens bank mower, three Castell rotary mowers (two 21" at the stadium and a 19" at the training ground), a Wessex sweeper and a second TechNeat SPPS 120 sprayer complete the list of machinery at Paul's disposal. End of season renovations were carried out, in May, by three separate contractors. Premier Pitches renovated the Turf Moor pitch, koroing off 15mm of vegetation, power harrowing and applying 200 tonnes of new M45 fibre sand from Mansfield Sand. Soil Ph was low so Paul also had 500kg of lime applied, along with 350kg of Scotts Sierrablen Plus Active 18:5:18+MgO fertiliser and a 100kg dose of Scotts Step HI-Mag. Twenty bags of R14 premier winter games mixture were used for overseeding. Talbot Turf renovated the first team training pitch to the same specification. The remaining pitches were renovated by local contractors, Danvic. This involved scarifying, verti-draining, topdressing and overseeding, with seed germinating within nine days. Once established, they were mown with the rotaries for a couple of weeks before using the cylinder mowers. However, Paul had to apply a further seven bags of grass seed on the stadium pitch after a heavy rain storm washed a lot of it away during the germination period. 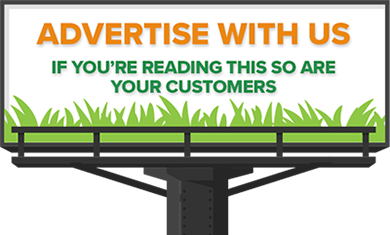 In late September, he applies a Scotts Greenmaster Prolite Double K 7:0:14 and, during colder periods, a dose of Scotts Invigorator 4:0:8. He also uses liquid irons, especially prior to games in the winter months, to maintain colour and harden up the grass plant. Height of cut at the start of season is around 25mm. This is raised to 28mm in late September/early October. 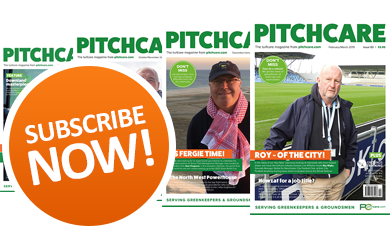 In early season, the pitch is mown on a daily basis but, once growth has slowed, frequency is reduced to two to three times a week then, in the winter months, only mowing to prepare the pitch for play. Paul makes good use of the brush and verticutting units on the Dennis G860s ensuring the grass is kept upright and thinned out to improve air flow around the grass plant. As with most stadium environments leaf spot can be a problem, so Paul uses a preventative regime of fungicides, using a combination of fungicides with varying modes of action. Scotts PrimoMaxx was also used in July to slow down growth. There is also a nematode problem to address. A count of the nematodes populations was carried out in the spring and a sample sent off to Dr Colin Fleming, who reported back with a strategy to combat them. Bio Mass sugars, that act as a bio stimulant, were applied. These feed the plant and, along with some natural chemical suppressants, ensure the grass plant remains stress free whilst reducing the nematode population. Different areas of the pitch can dry out at different rates and grass growth in shaded areas can often be less vigorous. 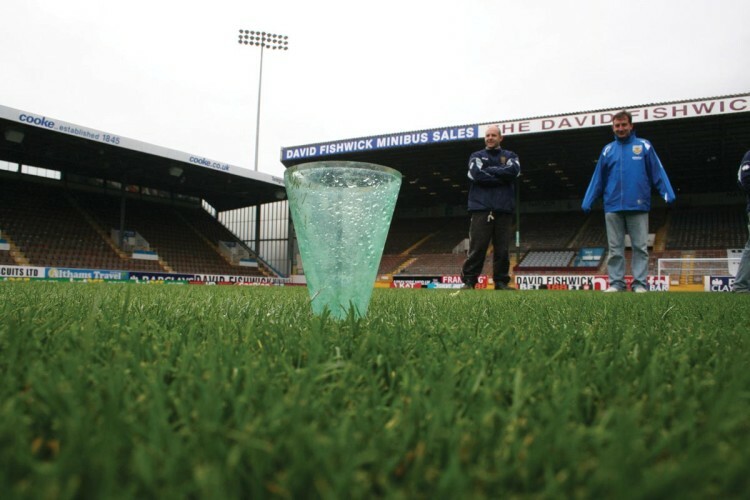 In the short time Paul has been at Burnley, he and his staff have learned how to manage the pitch to get the best out of it. The undersoil heating system has, over a number of years, baked the soil profile, causing it to become impermeable. Last year he had to dig out several problem areas within the playing area to improve infiltration and restore the porosity of the pitch. Also, it was installed quite shallow and this affects the ability to aerate the pitch to any significant depth. The Procore 648 is the only machine that allows for regular aeration to help improve the surface. Final match day preparations will include double cutting and marking out the day before. However, the Lancashire weather often dictates the workload! All four staff are assigned to matches, usually coming in at 8.00am and remaining until after the game to replace divots. The pitch is marked out using a Vitax transfer wheel line marker and a liquid marker paint, stringing out for every overmark. As for the future, getting back in to the Premiership has, for a life-long Burnley fan, been amazing. If they can stay up, there should be plenty of opportunity for Paul to put forward his plans to improve the playing surfaces at both the stadium and training ground. And, the extra income should mean that the £20 million earmarked for the redevelopment of Turf Moor and the surrounding area, to create a community sports and leisure village, should be available. Regenerating both the football and the cricket club, plus a leisure and hotel complex, will enable the Community Sports Trust to deliver a sports led approach that will breathe new life into the local community. The Gawthorpe Training Ground will be updated into an academy, allowing Burnley to, once again, encourage young talent. 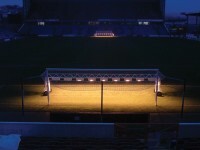 At the time of writing, Paul had just purchased two MU27 'baby' lighting rig units from SGL for the goalmouths. Although not the complete answer to his problems, he's sure they will help him through the winter months. With everything that is going on at Burnley, it will be a hectic time for Paul and his team, but it's a challenge he is looking forward to.